Application: Sewage Water, Light Chemical. SSE 25 series mechanical seals are internally mounted water seals. They are design for simple, economical, commonly used in water pump, submersible pump, light chemical, link plant etc.It is easy to install, it is available in mass quantity. These are low cost seals. We have carved a niche in this industry and engaged in offering superior quality Water Pump Seals. These heavy duty and premium quality Water Pump Seals provide safety and tapped holes so that they directly bolt water pump and stop the leakage. These seals can be availed from us at market leading rates. We are the leading manufacturers of Water Pump Seals. It applicable for all water pumps industries. Our customers can avail from us a wide variety of Oil Seal and Water Pump Seals. These are specially designed for their wide usage in handling all kinds of fluids such as oil, water and others. 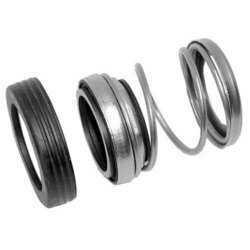 Owing to their high pressure endurance, these seals are widely appreciated across all industries. 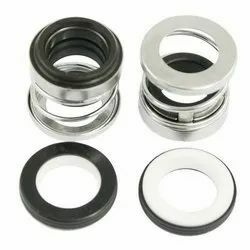 These seals are available with us at competitive prices. With the complete help and support of our team members, we deliver product that is certified and in compliance with the standards. We have a wide supply chain network that enables us to make delivery of consignments within the stipulated time.